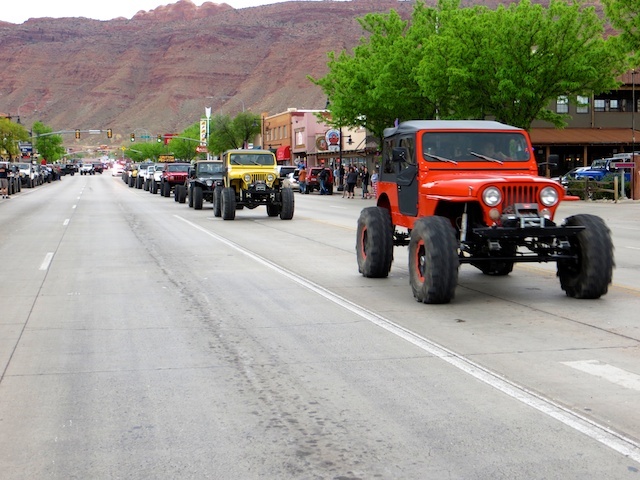 It pays to check the local events calendar before planning a trip to Moab, in southeast Utah. We’re arriving on the Easter weekend (prior to embarking on a canoe trip down the Green River) and are thus expecting heavier traffic. But we’re not quite prepared for the monster truck rally that doubles as the week-long Jeep Safari. Culturally interesting, perhaps, but non-stop traffic and noise, especially the midnight hammering of a dented axle in the RV campground, where tenters are definitely second-class citizens. The Easter festivities mean restaurant lineups at dinner and reinforce the merits of solo road-trip dining. With six palates to please, it takes five minutes to decide if the group wants to eat at a particular establishment, during which time three or four tables are snapped up and a 20-minute-plus wait is guaranteed. At which point, one person flees to Subway and another heads to Moab Diner for liver and onions. While a little heavy on the starches and gravy, the latter offers reasonable fare (“You can’t go wrong ordering a clubhouse or BLT,” one participant observes) and the added spectacle of efficient servers whizzing past with loaded plates decorating their arms. The good news is meal prices are quite reasonable for a tourist town like Moab. If this were Banff, a beer and a burger would set you back about $23. 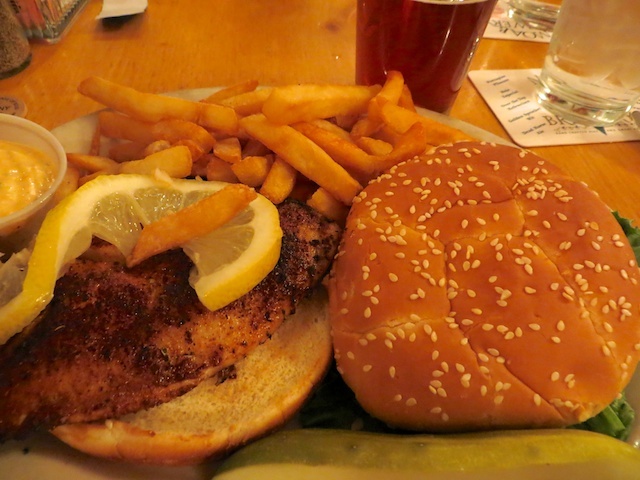 But at the packed Moab Brewery, a burger and fries cost about $8 and a house pint $4. Our preferred burgers are a few bucks more at Peace Tree Juice Cafe, but they are half-pounders from Angus beef. It’s also the only place pouring our favourite Moab Brewery beer, the Scorpion Pale Ale. 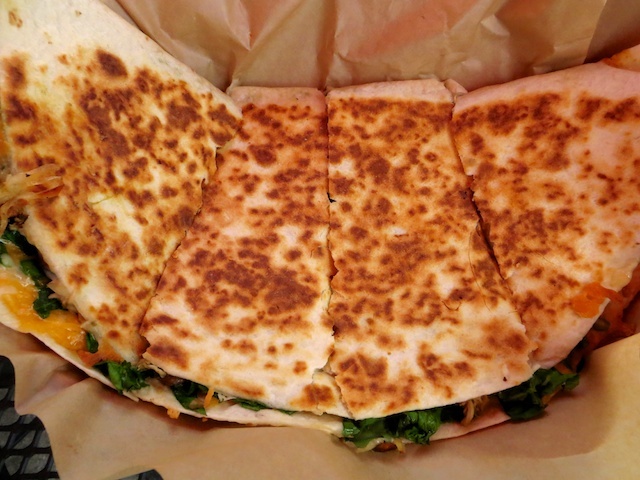 Being a minimalist road tripper, my best Moab meal is at the Quesadilla Mobilla truck, where we twice lunch on divine and inspired quesadillas in a downtown parking lot. 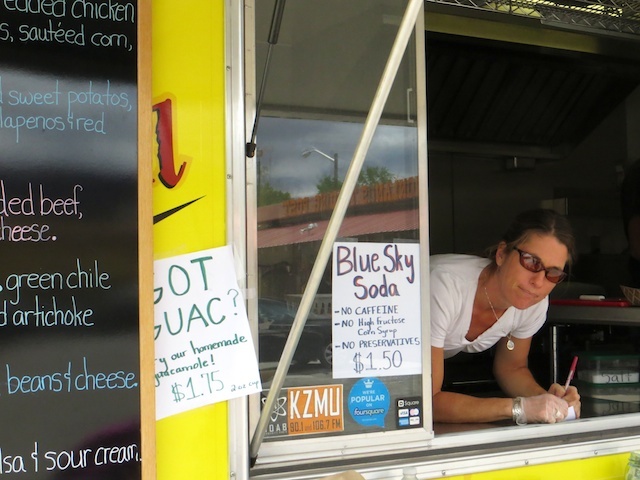 When they’re not off climbing (closed Tuesdays and Wednesdays), young owners Carrie and Steven have smartly focused on doing one unique thing extremely well. And most of our crowd, other than the semi-professional eater/blogger, have trouble finishing an $8.50 regular-sized quesadilla. Breakfasts are a tossup. For a quick, light meal, it’s hard to beat the efficiency and quality of Love Muffin Cafe, which pumps out a range of breakfast burritos and paninis (about $6) to fast-disappearing lines of customers. For $2 more, a friend loves the skinny omelette, a crepe-like delicacy containing spinach, red onion, mushrooms and feta cheese. 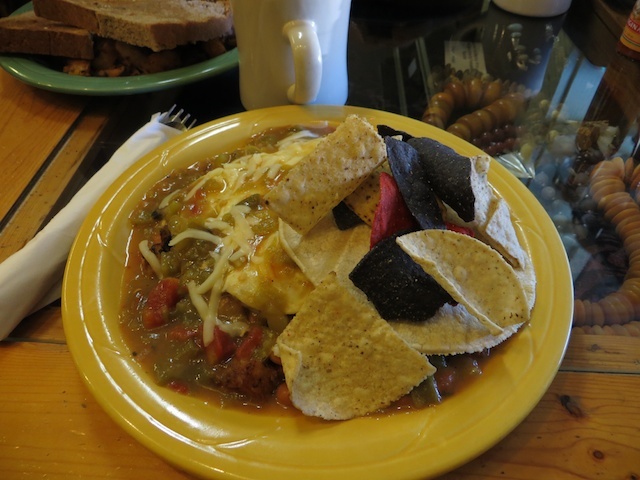 For heartier fare, there’s nothing like a mammoth plate of huevos rancheros at Eklecticafe. It’s undoubtedly Moab’s quirkiest diner, with a massive ceramic cup out front and tables containing collections of antique jewelry under glass. There’s a lovely garden patio, but on a chilly spring morning, it’s well worth crowding into the tiny dining room and enjoying the show, including a customer breaking a bookshelf she climbs onto to inspect a piece of art for sale. 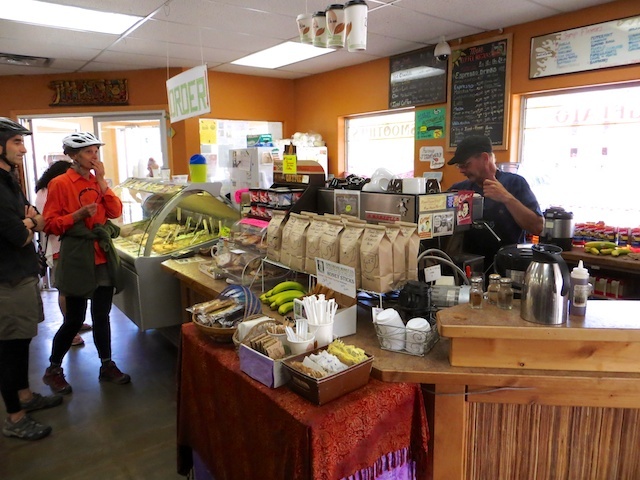 My go-to coffee shop is Moab Coffee Roasters, which pulls excellent eight-ounce Americanos and pours fine dark brews from their organic beans. My only quibble is the lone barista running the entire place the first hour of business, when people are lining up for their java jolt. 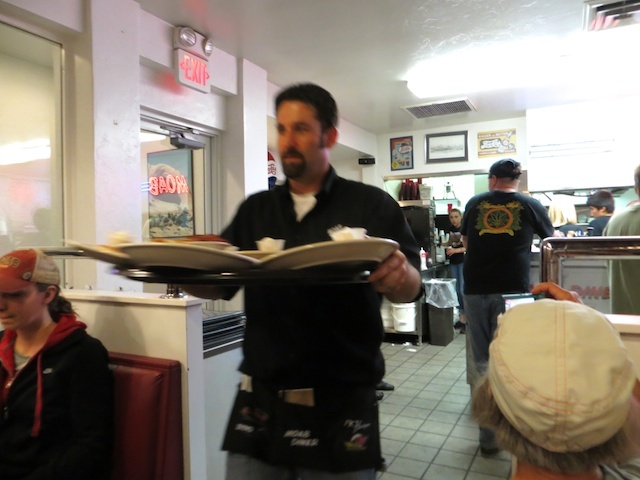 This entry was posted in American restaurants, Moab, Utah and tagged Moab Utah on May 12, 2014 by bcorbett907.